Khaled Barakat’s friendly smile acts as a beacon at the University of Alberta’s Li Ka Shing Institute of Virology. Sitting behind his desk in the Faculty of Pharmacy and Pharmaceutical sciences discussing the academic achievements that he has been a part of, his smile grows, displaying his undeniably positive and passionate nature. “I started out in engineering, moved to engineering physics and now I’m in virology. I’ve just been following my passion – really my passion is discovering drugs for cancer, or for chronic infection,” says Khaled Barakat. Barakat is head of a multidisciplinary team of world-class researchers at the University of Alberta. As a child, he was a boy with lofty dreams of changing the world, who in time became a top-notch researcher on the cutting edge of cancer research. Throughout his life he has seen incredible progress in science and technology. Growing up in Egypt, he witnessed the effects of serious illness – hepatitis C plagued his neighbours and friends, but the subsequent development of specialized care to treat those infected with the disease led to his first sparks of interest in biomedicine. Barakat began his academic career at Cairo University, where he graduated in the top of his class with a degree in electrical engineering. Following this period, he began work on a master’s in engineering physics. It was during this program that he became aware of computational modelling technologies and their disease-fighting potential. Using high-powered computers, Barakat can predict the interactions between objects on a molecular scale. “I was amazed at how computers were able to simulate interactions – how things moved, how they interacted. After finishing my master’s, I started to think about how we could do this to discover new drugs and help patients,” says Barakat. 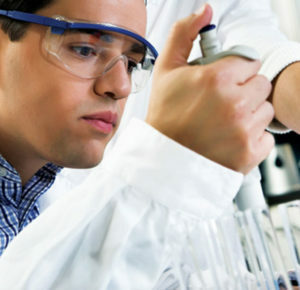 In the past, new drugs have been discovered through biological screening, using chemicals in a wet laboratory. The interactions of potential new drugs with targeted cells would be studied by pharmaceutical companies to understand how these drugs might fight cancer cells. But the process was often costly and time-consuming due to the amount of physical work required to run the tests. Instead of performing this research in a traditional lab, Barakat uses a supercomputer to help researchers map the atomic structure of cancerous or healthy cells. Using extreme computing power, he can screen potential drugs to understand their behaviour with cells. This can help predict interactions between drugs and targeted cells, and has led to more thorough research that progresses much faster than it would have in the past. Whereas a typical pharmaceutical company would use a wet lab to screen through up to a million compounds, Barakat’s supercomputer can be used to theoretically screen billions of interactions, allowing researchers to then focus their efforts on the drugs most likely to be useful and least likely to cause serious side effects. After completing his master’s degree, Barakat began putting together a team of specialists from the U of A to examine the potential applications of electronic modelling in cancer research. Along with a team of eight other researchers from dentistry, pharmacology, oncology, chemistry and virology, Barakat has harnessed the power of supercomputers and complex computational modelling to begin looking at fighting cancer on a molecular level. 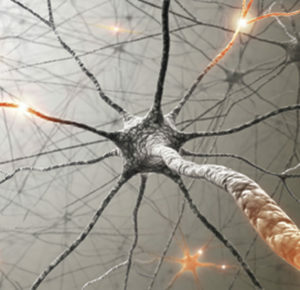 Currently, they are focused on finding minimally-invasive treatment methods. Their preliminary work has allowed them to test their theories using T-cells, a part of the human immune system that works to protect the body from infection. When a tumour begins to grow in the body, it binds with specific receptors on the T-cell, called immune checkpoints, reducing the effectiveness of the immune response. Their research has focused on injecting antibodies that reactivate the body’s T-cells, prompting them to respond to cancerous cells. “We proved the concept, which means that [it] is working both in biological and biochemical ways. Which means, we are on the right track,” he says, adding that his team will aim to begin drug trials of these treatments by 2020. Along with a team of eight other researchers from pharmacology, oncology, chemistry and virology, Barakat has harnessed the power of supercomputers and complex computational modelling to begin looking at fighting cancer on a molecular level. Though this work has been promising so far, Barakat says that the use of these antibodies is extremely costly (upwards of $120,000 for four doses), and impractical over the long term. The use of these antibodies over extended periods can overstimulate the immune system, causing serious long-term side effects. Instead, the team aims to discover a small molecule that could target specific tissues to fight cancer, and could be quickly removed from a patient’s system to decrease potential side effects. Barakat’s work has attracted attention from researchers around the world, including several students working to complete masters and post-doctoral programs. As he has built the project team over the last several years, word of his expertise has spread quickly, piquing the interest of medical communities worldwide. Barakat’s high standards and determination are evident even outside of the computer lab. 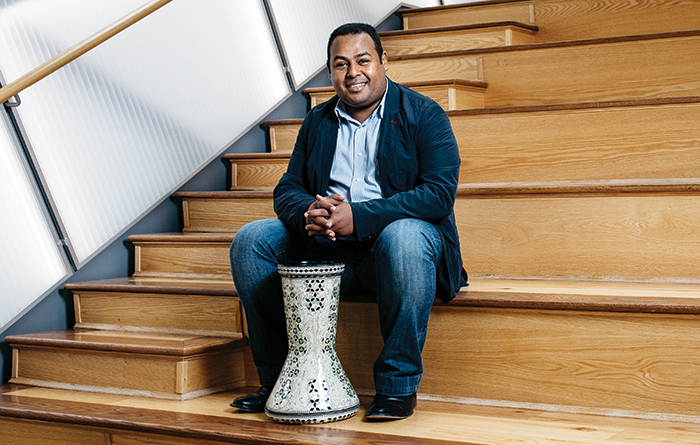 When he’s not entering complex data into the university’s supercomputers, or trying to imagine new molecular interactions to further his research, Barakat finds joy in a surprisingly creative outlet – playing the darbuka, a hand-held drum he has played since his youth. “When I was an undergrad student in engineering, my colleagues always used to rent drums for me. I used to always play at private parties with my friends too. I enjoy it very much,” he says. Each night, after putting his children to bed, Barakat sneaks down to the basement to play the drums. This long-standing tradition allows him to unwind, though he’s quick to point out that no matter the time of day, nor the activity, he is always drawn back to his passion for research and learning. “I am very focused on my work when I am here. But even when I go home, I am always thinking of my work, even if I am drumming. Sometimes I will get an idea, and I will just write it down and follow-up in the morning when I come back here,” he says. Driven by his lifelong desire to improve the lives of others, Barakat notes that his musical talents were just one way for him to bring joy to others. Though he still enjoys playing each night, he acknowledges that the real successes in his life have come about from following his passions in life. “I started out in engineering, moved to engineering physics and now I’m in virology. I’ve just been following my passion – really my passion is discovering drugs for cancer, or for chronic infection. Basically, I want to do something that can help a lot of people,” says Barakat. This passion is evident in the way he discusses his work, and is obvious to the members of his team as well. “On a personal level, he’s fantastic to work with. He’s a delight, he’s genuinely excited about what he’s doing, just such a charming character full of joy. He realizes he is at the cutting edge of biomedicine by linking virology with supercomputers. He’s transforming us,” says Houghton. Along with a team of eight other researchers in the fields of pharmacology, oncology, chemistry and virology, Barakat has harnessed the power of supercomputers and complex computational modelling to begin looking at fighting cancer on a molecular level. A:I’d go to the future. I would love to see how medicine evolves. All of my work focuses on the future, on what is possible. Like many, I hope that cancer will disappear in the future, so I’d really like to see how treatment evolves over the next 100 years. Q: You’ve got three young children. What advice would you give to other parents? A: It’s hard to be a researcher, but it is extremely hard to raise a large family in the meantime. My advice to parents is to remember that your family has nothing to do with a hard day at work. I always schedule my meetings so that they don’t interfere with me picking up my kids from school, daycare or even serving as a coach for my four-year-old’s soccer team. Q: Aside from drumming, what is your favorite pastime? Q: What is the most important lesson you’ve learned in your life so far? A: Besides being a good teacher you have to be a very good student. Always expect to learn new things and always respect your teacher. Listen carefully, be modest and never underestimate the abilities of your teacher, even if it’s your child – sometimes I learn new English words from my kids.